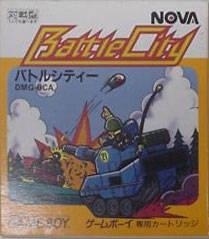 Battle City also known as Tank 1990 or Tank in some pirate multicarts releases is a multi-directional shooter video game for the Family Computer produced and published in 1985 by Namco. The game was later released for the Game Boy and was included in the Japanese version of Star Fox: Assault. It is a port of the arcade game Tank Battalion with additional features (including two player simultaneous play, and an edit feature, both explained later). There was also a rendition for Nintendo's Vs. System arcade cabinets. The player, controlling a tank, must destroy enemy tanks in each level, which enter the playfield from the top of the screen. The enemy tanks attempt to destroy the player's base (represented on the map as a bird, eagle or Phoenix), as well as the human tank itself. A level is completed when the player destroys all 20 enemy Tanks, but the game ends if the player's base is destroyed or the player loses all available lives. Battle City contains 35 different stages that are 13 units wide by 13 units high. Each map contains different types of terrain and obstacles. Examples include brick walls that can be destroyed by having either the player's Tank or an enemy Tank shoot at them, steel walls that can be destroyed by the player if he has collected three or more power-up stars, bushes that hide Tanks under them, ice fields that make it difficult to control Tank and pools of water which cannot be crossed by Tanks. There are four progressively harder types of enemy Tanks. The game becomes more challenging in later levels, as enemy Tanks may act as decoys to lure players away from their base so that another Tank can destroy it. In addition, flashing Tanks could be destroyed for power-ups. There are several types of power-ups: Tank symbol gives an extra life, star improves player's Tank (having one star make shots faster, having two stars allow two simultaneous shots, having three stars allow the player to destroy steel), bomb destroys all visible enemy Tanks, clock freezes all enemy Tanks for a period of time, shovel adds steel walls around the base for a period of time and shield makes player's Tank invulnerable to attack for a period of time. Battle City was also one of the first games to allow two players to play simultaneously. Both players have to defend the base together, and if one player shoots the other, the friendly fire victim would freeze for a while (but can still shoot). Battle City was one of the first NES games to allow players access to an edit mode where they could create custom levels. However, custom levels cannot be saved.